What do you look for when you want to buy a new laptop? is it specifications? design? or the price?. What if we tell you that there’s already a laptop which has all the three things and impresses you every time you use the laptop. Yes, we are talking about the recently launched Asus Zenbook flip. The laptop has got a pretty cool name and we felt really cool using it too. The thing which caught our attention is the slim and convertibility of the laptop. The Asus Zenbook flip is convertible which can be used as a laptop and as well as a tablet also. The Flip offers a slim and portable design that’s easy to afford and easy to use. The company sent us the review unit of the newly launched Asus Zenbook Flip UX360 and here’s our take on it. The Asus zenbook flip ux360 is really very slim at 0.54 inches thick and 2.8 pounds, this convertible is thinner and lighter than rival 2-in-1 machines. The zenbook has got a fanless design thanks to Intel Core M processor which sips just 4.5W of power when compared to Competitors like Lenovo’s Yoga 710 and 910 pack 15W processors. The Asus Zenbook flip is all about the ultra portability. 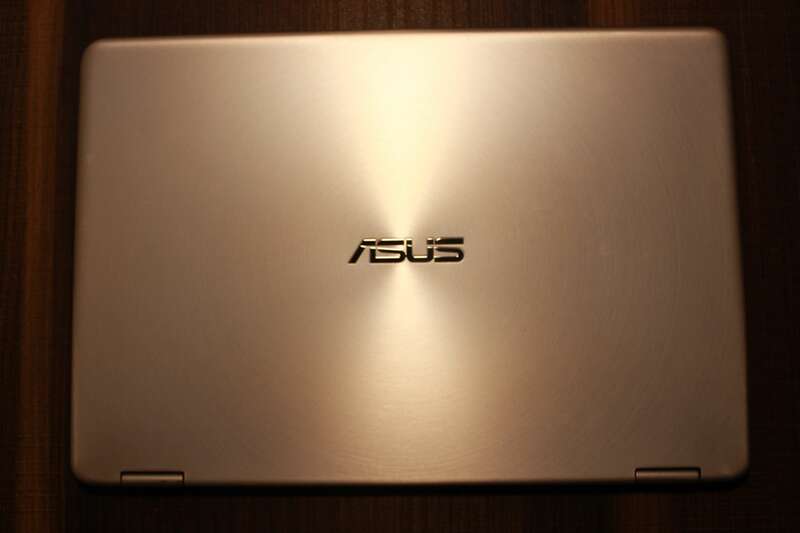 The Zenbook flip features a completely different design from Asus’ usual. The sharp edges from other Zenbooks are replaced by a rounder profile, and it feels like a single block of aluminum indeed. The concentric circles still remain, though. The Zenbook flip offers an attention-grabbing 13.3-inch IPS panel with touch support. 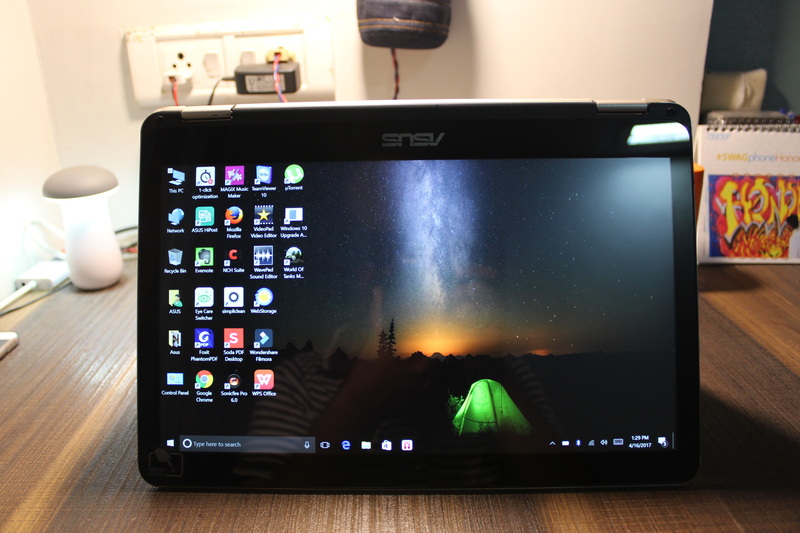 It looks semi-glossy to our eyes (even though Asus labels it as “anti-glare”), offers wide viewing angles, and has a sharp picture with great colors. Overall, it’s higher-quality display than we expected from a laptop at this price. The Zenbook should have flexible hinges understandably from a convertible point of view but the hinges have too much play and at times when you perform touch operation in laptop mode, which is how you’ll be using it most often and the screen wobble when performing touch commands. Next, speakers on the laptop are at the bottom, which means they’re muffled when using it in the tablet mode. Yet another reason why you won’t be using it so. Overall, the Zenbook Flip UX360CA is well designed from an ultraportable point of view, but there are definite holes from a convertible point of view. The Asus Zenbook Flip UX360 comes equipped with 2 USB 3.0 Ports on both the sides and on right there is a USB type – C port along with micro-HDMI port and 2-way headphone-mic port (3.5mm). On the left, you will find the power and volume keys. There’s also micro sd card reader for those who need it. Apart from these, you get the micro-HDMI to HDMI converter and USB to Lan converter. Out of the latest ultrabooks, we have seen the Asus Zenbook Flip UX360 is the only one that provides a favorable number of ports. From left to right – 3.5 audio in port, Micro HDMI, Type C, USB 3.0 and Power port. On paper, the 13.3-inch screen is very good. In practice, it’s a mixed bag. The vibrant IPS display delivers rich colors and strong contrast, and the touchscreen is responsive. Viewing angles, too, are good and everything is pin-sharp on the 1080p display. Asus only sells 1080p variant in India and for the most part, it does the job. Colors look nice with 97% of the sRGB gamut and 71% of the NTSC gamut. This is in line with Asus’ claim of 72% NTSC color. However, it’s dim and glossy, which really gets in the way of outdoor usage. In fact, even watching movies indoors can be problematic sometimes when your reflection shows up more often than needed. It is evenly lit, but maximum luminescence of 214 Lux just doesn’t cut it. The Display rest on the hinges which are too flexible and at times when you move around with the laptop screen open the screen moves to an 180-degree position which can be quite annoying. The hinge could have been little stiffer to prevent it from happening. Not a huge problem though. The Asus Zenbook flip is powered by Intel’s M3 6Y30 processor with 4GB of ram and 512GB of SSD storage. On paper, this configuration does not look great when compared to price. This is until you actually use the laptop. The Asus Zenbook flip is fast enough to run 10 – 12 tabs on chrome browser at the same time with 5 extensions and Microsoft word running in the background. It is quite clear from the specification that this laptop is not for gamers out there as the complete laptop is designed for portability and business users in mind. The casual gamers can play mobile games, like Asphalt 8, satisfactorily with the help of Intel HD 515 GPU. While Asus Zenbook flip isn’t for the gamers and demanding editing software, it can handle video playback well. You can play the highest resolution video, or stream on Netflix, without any lags or stutters. The notebook managed Geekbench scores of 2,335 (single-core) and 4,723 (multi-core), with a PCMark Home score of 2,274, which compares very similarly to its competition. The Asus Zenbook flip has a 512GB SSD inside, which takes about 30 seconds to transfer a large 5GB file from one folder to the other. A collection of files worth 20GB takes over 2 minutes, at a peak speed of 17 MBps. That is slower than ideal, but not really a big issue. The laptop does get heated when you put it up for a charge. While on battery it requires some doing to get this thing heated up. The temperature can up to 40 degrees when the machine gets heated. The passive cooling works great in favor of Asus Zenbook Flip UX360.However, the keyboard and touchpad never got hot enough to be uncomfortable. 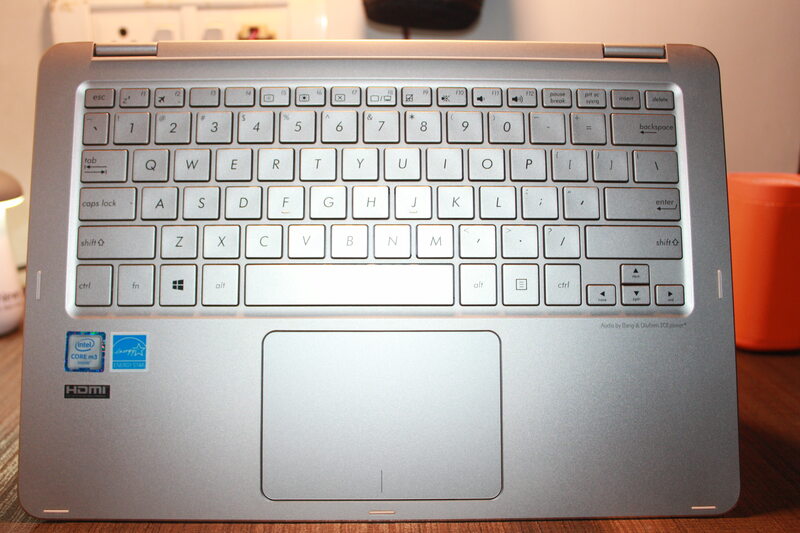 The keyboard on the Asus Zenbook flip UX360 is quite impressive. Key travel and pitch are good so that you can type fast without a steep getting used to period. However, key feedback could perhaps have been slightly better. 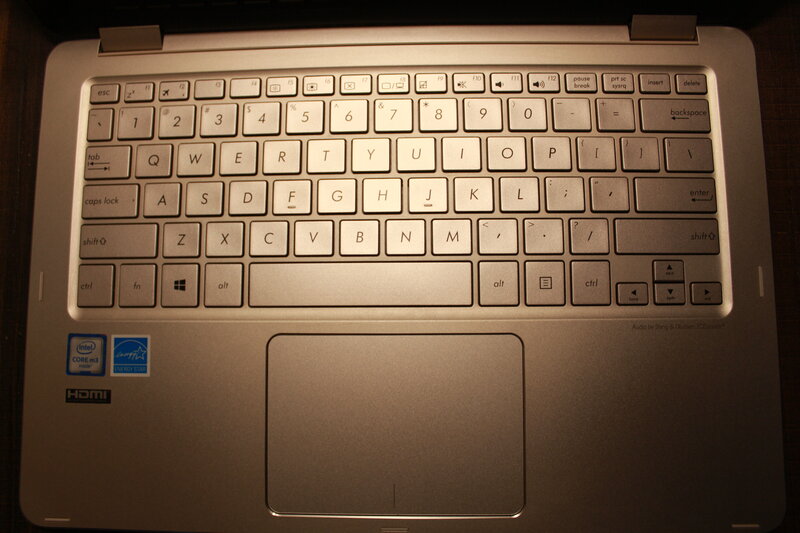 The thing which felt disappointing was the keyboard is not backlit for a laptop which costs around 60K. When you turn to tablet mode the keyboard and touchpad are disabled automatically. The touchpad recognizes gestures most of the times but sometimes the gestures are counted as clicks. The touchpad recognizes the clicks based on the left or right part you are tapping. 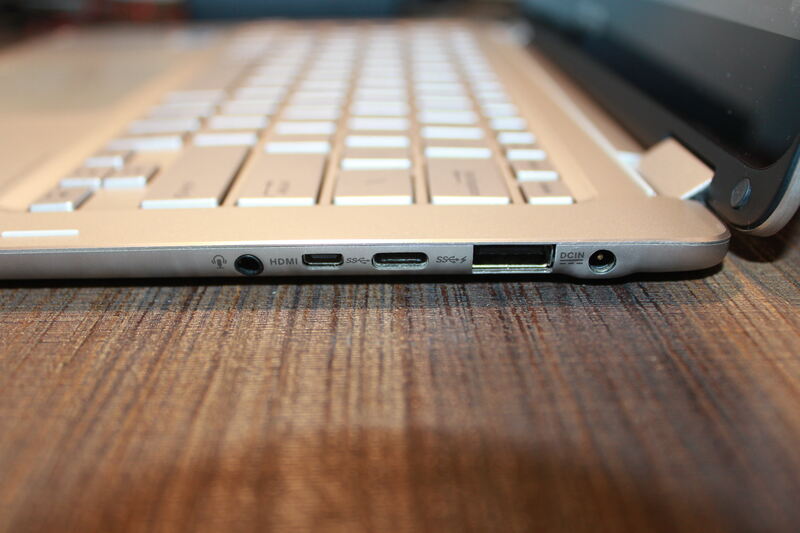 The Asus Zenbook flip ux360 has two speakers at the bottom. Beds or similar surfaces will muffle the bottom-mounted speakers, but the speakers are just about loud enough in other cases. For a laptop, the audio quality isn’t decent, but you’ll need headphones if you want high-quality audio. The speakers will work if you need to share a presentation with someone or watch a quick video on YouTube, but that’s about it. The Asus Zenbook flip has intel’s m3 processor which is known low power consumption. The device lasts for around 7 – 8 hours on a full charge with mixed usage. While on continuous playback the device lasts for 6 hours. It lasts for 5 hours and 20 minutes on PC Mark’s Work battery test, which is quite good. Asus Zenbook Flip UX360 has great design and portability option. The Flip is better as far as portability is concerned, and if that is your priority, then the compromises may still be worth it. The Asus Zenbook Flip UX360CA is definitely worth considering, but not the best you can buy.